Welcome to 1602 Concord Place in Hollin Hall! Beautiful curb appeal welcome you to this lovely residence sited on a level yard on a quiet cul-de-sac. This home showcases 4 bedrooms and 2 full and updated baths and a huge two-story addition. 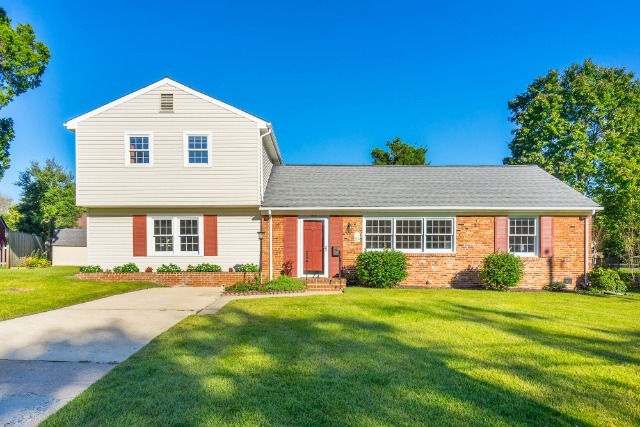 A lovely brick stoop, lush green grass and gardens greet you as you walk up to this home. The longtime owner home has maintained every system and aspect meticulously. Gleaming hardwood in the living room, dining room and two main level bedrooms provide perfect floor plan and flow for an easy and comfortable life style. The kitchen provides access to the dining room, living room and the backyard/deck. There is a large and comfortable family room on this level as well as a full bath, a laundry nook and another backyard access option. Walk upstairs and enjoy two large bedrooms with tons of closets. Truly a unique find in the Hollin Hall Neighborhood. Hollin Hall provides great walkability to shops and restaurants. An amazing location with great commuting options to Fort Belvoir, The Pentagon, Old Town, the District. Enjoy life close to the Potomac River and the George Washington Parkway and Bike Path. Enjoy peace and quiet in the greater Fort Hunt Community and enjoy all this beautiful area has to offer. From Fort Hunt Road North or South, make a right or left on Shenandoah to enter Hollin Hall neighborhood. Left onto Wellington Road, right onto Concord Place, home up on right in cul-de-sac.